In Rancho Santa Fe share your life story for loved ones. Milestones, the Gift of a Lifetime will help you write your life story in your words. Bonnie Bell, MSJ, memoir writer and founder of Milestones is a published journalist skilled in the art of interviewing. Based in Indian Wells, CA Bonnie has more than 20 years experience in writing biographies as a correspondent for People Magazine. Milestones, the Gift of a Lifetime (www.yourmilestones.net) has produced numerous quality books for its clients. From business, the arts and politics to military service and adventure travels, your memoirs will be the most treasured gift you can give to loved ones and generations that follow. Call today for a complimentary consultation. In the convenience of your home, I will preserve your memories into a professionally edited account of your life, including photos and memorabilia. 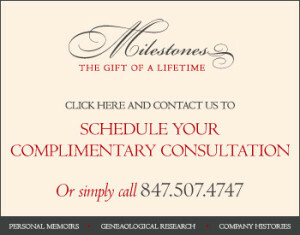 Find out more about Milestones, the Gift of a Lifetime providing memoir writing in Rancho Santa Fe, CA 92067.